Liberty University hosted its most highly anticipated Convocation speaker on Monday. In a speech that began with the dire state of the nation’s economy and its failed foreign relations, Donald Trump engaged students for 30 minutes about the values that brought him to the pinnacle of real estate development and business success. The event was attended by national and local media outlets and no doubt drew the largest audience ever. More than 10,000 students attended Convocation in the Vines Center and the event was broadcast live on The Liberty Channel and made available to more than 80,000 Liberty University Online students via a new Online Communities website. The strong local interest in Trump’s appearance led the university to create two satellite locations, Thomas Road Baptist Church and the Towns Alumni Lecture Hall. A surprise guest, former Republican presidential candidate Michele Bachmann, sat on the stage during the event. Bachmann spoke to students at Convocation last fall. Trump began by praising Liberty and honoring its founder, Dr. Jerry Falwell, Sr., whom he had met on several occasions. Trump’s talk first focused on the nation’s debt, unemployment, dependence on foreign goods, and the oil crisis — and the lack of leadership to tackle these ever-growing concerns. Through his rise to the top in TV’s “The Apprentice,” now going into its 10th season, he had much advice to give students: follow your instinct, honor your commitments, and love what you do. Trump finished by addressing a few questions from students, which had been texted during the speech. They ranged from his earliest business ventures, to his best day on “The Apprentice,” to what courses to study to reach their goals. In a press conference following Convocation, Trump answered questions pertaining to his speech and his political views on the 2012 presidential election. He then had a chance to tour campus and spend time with the Falwell family and other members of Liberty’s administration. A highly sought-after speaker, sometimes making up to $5 million for one event, Trump said he waived his fee to speak at Liberty as a gift to the school. And he said he’d like to return. 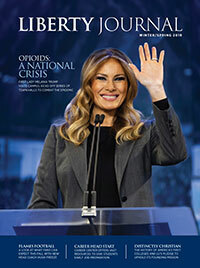 Read more about Trump's visit from The News & Advance.